Tickle My Senses: Bachelors Chicken Sukka or Mangalore Style Spicy Chicken with Coconut. 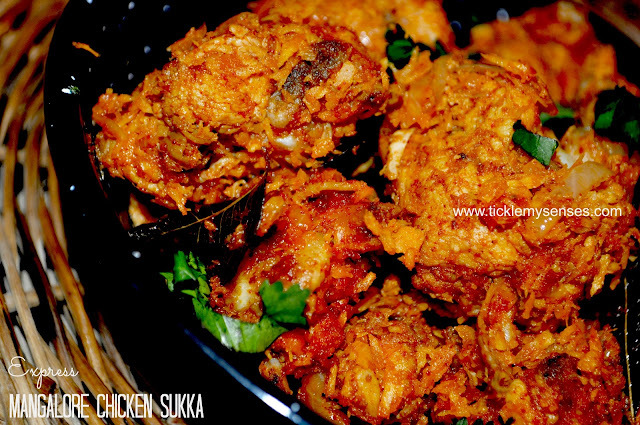 Chicken Sukka is a popular and much loved dish among Mangaloreans. Every family has their own way of making it. Some families follow the traditional way of making the Chicken Sukka, by grinding down spices in a stone and then cooking the meat in this paste, finishing off with a final garnish of roasted coconut and onions. This dish tends to be richer, full on flavour and delectable, but time consuming. 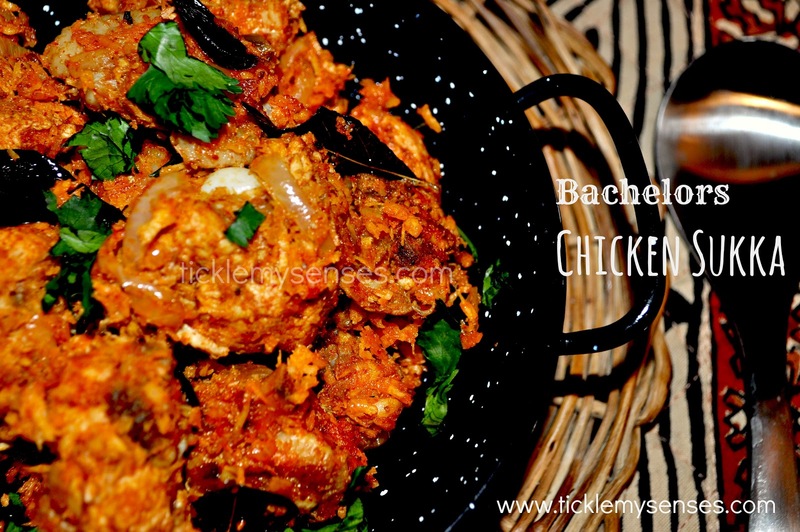 For those of us who have a busy lifestyle, for busy moms, kitchen novices or Bachelors, todays Chicken Sukka recipe may come as a blessing :) It is a simplified version to make this dish in a jiffy without breaking a sweat and with minimal fuss. It is prepared using the versatile Mangalore Bafat/ Baffat/ Bafad powder that is used to spice up many a dish. 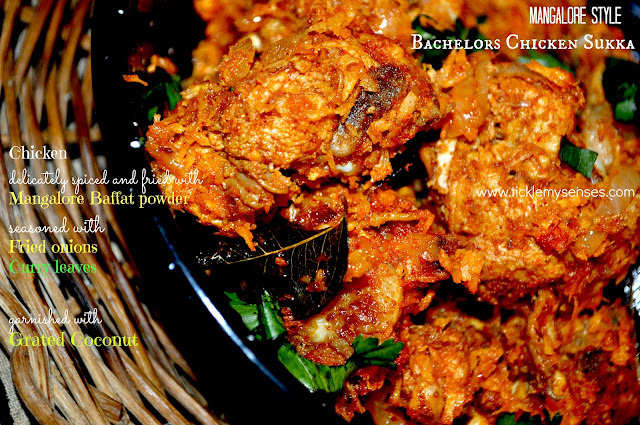 Check out my mom's Bafat powder recipe here. Coriander leaves: a big handful very finely chopped. Keep aside 2 tbsps of chopped leaves for garnish. 1. 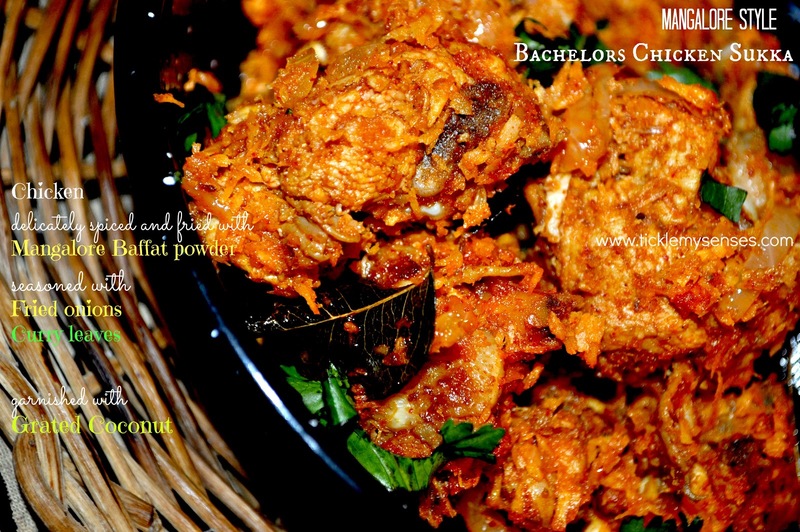 In a bowl marinade the cut chicken pieces with the Marinade ingredients (lemon juice, salt and Bafat powder). Keep aside for 10 minutes while you prepare the slicings. 2. In a heavy bottomed non stick pan take 2 tbsp oil add the slit green chillies and curry leaves and fry for a minute. Add the marinaded chicken and finely chopped coriander leaves and fry the chicken on a medium heat without adding any water till half cooked. Then add the Bafat powder and mix the chicken well. Cook till done. 3. In a non stick pan fry the sliced onions and grated coconut seperately till light brown and keep aside. Add the fried onion and coconut mixture to the cooked chicken and mix well. Taste for salt and sourness and adjust. Garnish with chopped coriander leaves. Serve along with white or boiled rice, piping hot Mangalore Style saar or lentil soup and enjoy! I hope you do try and enjoy this simple version. If you did enjoy this post, do drop me a line on my Facebook page or at carol@ticklemysenses.com, would love to hear your comments on it. Just drooling looking at your receipes. Wow ............. imagining having it with neer dosa or hot rice and tomato saar. 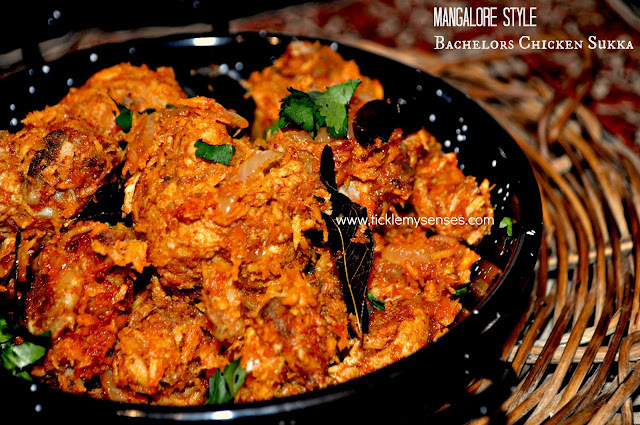 Keep on posting all our mangalorean delicacies.